Update: tasting notes have been posted here. I have always said that I want to be the equivalent of a Crazy Cat Lady when I get old(er), only with yeast instead of cats. Or maybe both, I do like cats. Regardless, I definitely want to be known around town as that weird old guy whose house is absolutely lousy with Brettanomyces. (They say you can't even set foot in the kitchen without stepping on yeast poop.) Every Halloween, I will give out vials of Brett to Trick-or-Treaters. I've at least got the crazy beard part down, so I think I'm well on my way. However, it would seem that there are some people out there who are well ahead of me. For instance: Switzerland-based brewer Sam, who runs the blog Eureka Brewing. That dude is currently rocking around 100 strains of yeast and bacteria in his home lab — seriously impressive. Many are Saccharomyces strains from commercial sources, while many others are isolates from commercial wild ales — wild bugs in a commercial package, the content of which is anyone's guess. Well, Sam has isolated about 20 strains of Brett from these varied sources, and most of these have probably never been brewed with in isolation before, by anyone. Crazy. 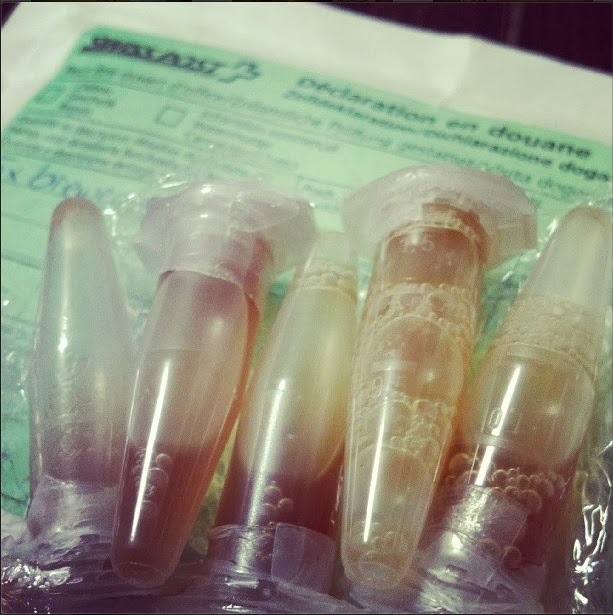 But what does one do with 100 different strains of yeast and bacteria, especially when it is not Halloween — and thus judgmental, close-minded neighbors might not think so highly of you handing vials out to children? (Fermenting stuff is a great Science Faire experiment, guys). Enter Jeffrey Crane of Bikes, Beers, and Adventures, who you may remember from that time he gave me some Custersianus. In Sam's words, from his original blog post on the Great Brett Experiment: "Since I haven’t actually brewed with any of the strains yet and kind of postponed the testing part for later on, we both agreed on an experimental setup to test all the different Brettanomyces strains in a single Brett-beer experiment. The basic idea is to brew a rather simple beer, split the batch and ferment the split parts with individual Brettanomyces strains only." Basically how I test out multiple new Brett strains normally, only Sam was rad enough to mail these out to brewers all over the world. I was hesitant about joining in on this awesome experiment for about two or three minutes because I knew there was no way I could possibly manage all 20 strains at once. I typically brew a little more than 4 gallons of beer per batch, and 5 gallons would be all I'd want to tackle in one go. In retrospect, I feel like a bit of a wimp, but oh well. I picked out five strains pretty much at random, and Sam shipped out these super-tiny 1.5 mL Eppendorf tubes to all the participants in August. Sam's generosity and coolness for putting this huge undertaking together cannot be understated. The first starter was done with small 8 oz mason jars. Each strain was pitched into a starter of ~200 ml low gravity wort; the lids to the jar were screwed on about a notch or two away from "tight"; the jars were then shaken intermittently. All strains showed signs of activity within a week. These starters were held as-is for a few weeks, due to me traveling. A week before brew-day, I stepped these starters up to 800 ml, again using (larger) mason jars with lids not-quite-sealed. On brew-day, the wort was split between 5 one gallon jugs, aerated for 75 seconds in the kettle with pure O2, and then the entire starter of each Brett was pitched. From my experience brewing with a variety of Brett strains, pitching Brett around lager rates is a good rule of thumb, and from my experience using Dmitri's BKYeast isolates from Cantillon, really wild yeasts (yeasts that have spent years lurking in oak and lambics) may need an even more comfortable fermentation environment. 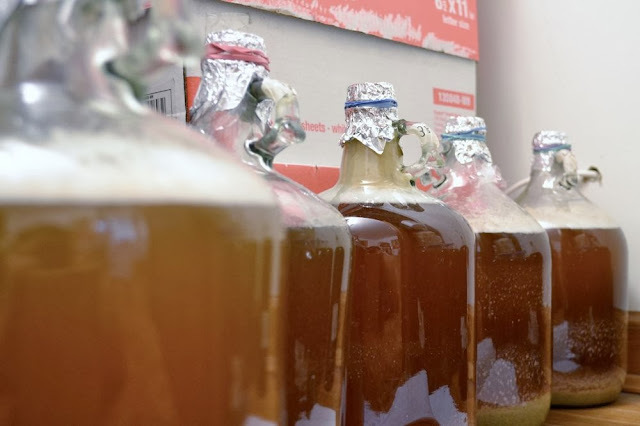 These are strains which have never in their genetic history fermented an entire beer on their own; they are used to a very different environment, a very different process. While I likely over-pitched, it paid off: four out of five jugs had a healthy krausen forming or already underway within 36 hours. (One strain, EBY038, was actually fermenting by the next morning). So, everything looking good so far. Given that these Bretts are harvested from so many different sources, it'll be interesting to see if any of them closely resemble existing strains. In Sam's collection, there were eight different Bretts isolated from Cantillon sours, so it's reasonable to assume that some of those may resemble, or even duplicate, the three strains harvested by Dmitri for his BKYeast collection. I've always had good luck with my Brett experiments so far, but there's certainly no guarantee that every strain here will be good for 100% Brett fermentations. With the sheer number of unknowns, this is definitely one of the most exciting experiments I've stumbled into so far, and even more interesting with many other homebrewers logging their own results. Here's my follow-up post for this batch with tasting notes for each strain. Cool. Looking forward to hearing the results. Can't wait to hear your results. I need to get my batch going soon. I got 4 strains but one of them is has a pretty funky looking scooby-esque thing going on. I remember seeing that on Instagram or Twitter or some such. I'm certainly very curious how that one tastes!